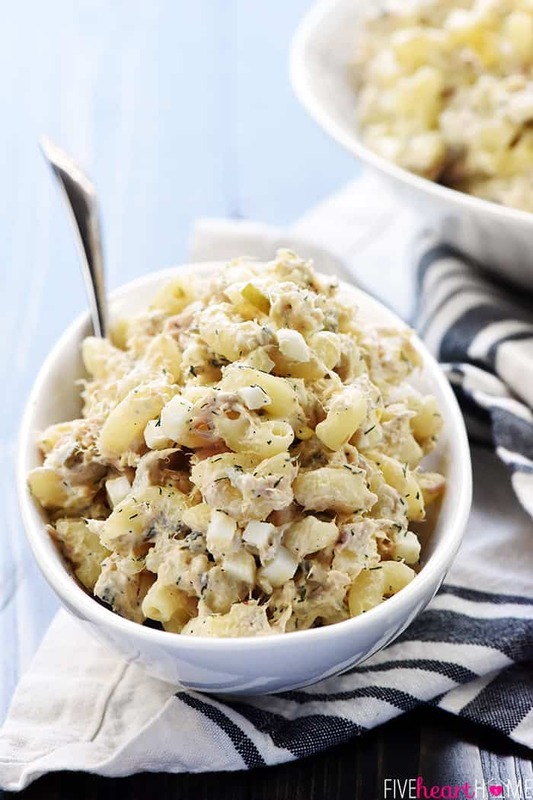 Tuna Pasta Salad features whole wheat macaroni, hard-boiled eggs, two kind of pickles, and fresh dill in a lightened-up dressing of mayonnaise and Greek yogurt! 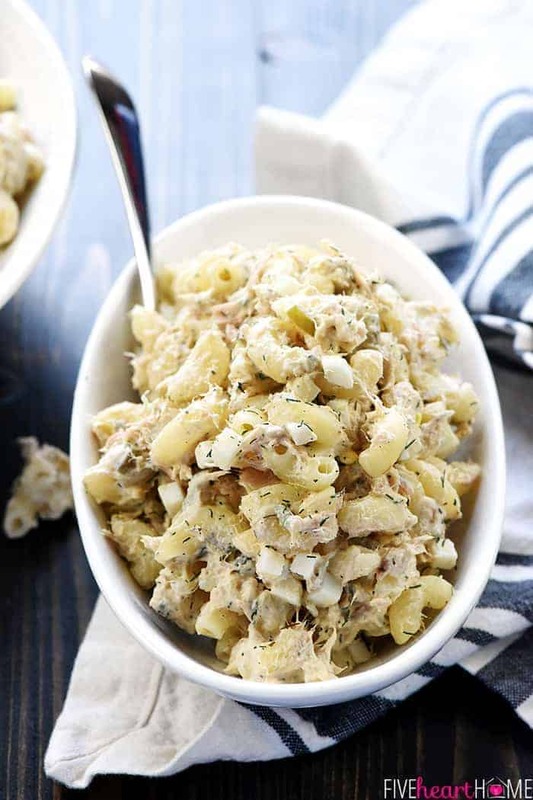 Tuna Pasta Salad is one of those quick, easy recipes that I’ve loved since I was a kid. 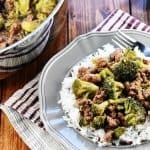 Growing up, this was a common lunch at our house on Saturday or Sunday afternoons, and as such, that’s often when I find myself making it for my own family. 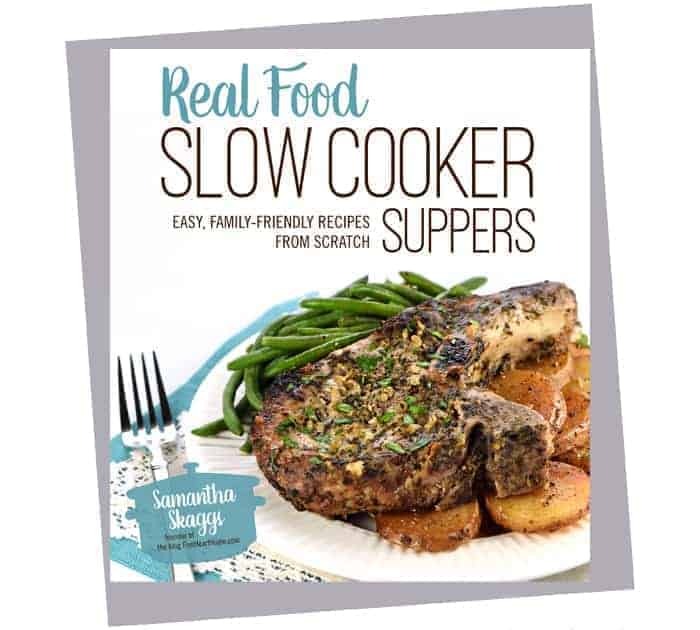 That being said, it’s also great as a weeknight dinner (particularly when you’re overdue on a grocery store run and down to basic pantry staples) and it’s perfect for Fridays during Lent which, for some of us, is coming up in a few short weeks. 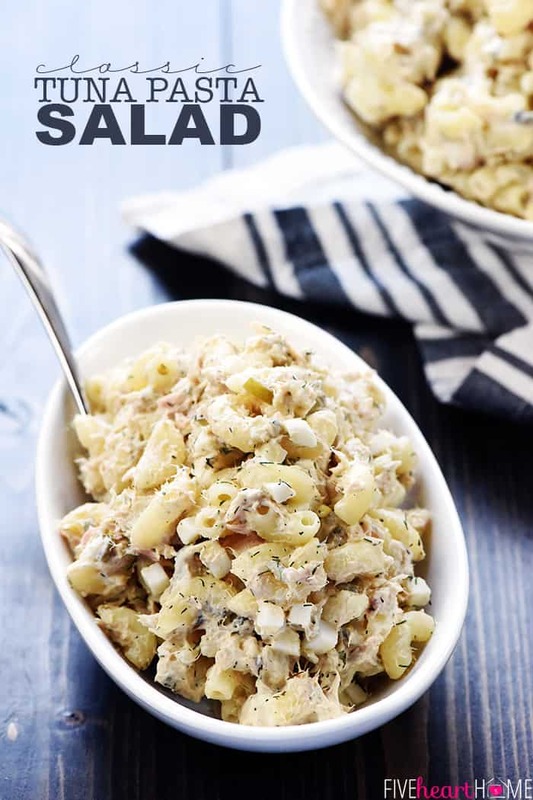 I make my Tuna Pasta Salad the same way my mama always did…simple and classic but with a few twists to make it healthier and, in my humble opinion, even more flavorful. I start off with water-packed tuna, and I always buy chunk light (skipjack or tongol), since it’s lower in mercury than chunk white (albacore). Next, to make my Tuna Pasta Salad a little healthier, I prep it with whole wheat macaroni. 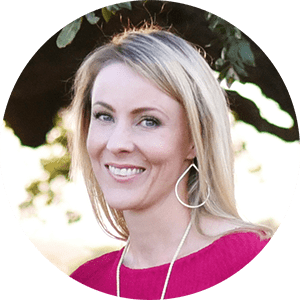 You can use your favorite shape of pasta, and you may certainly use white pasta instead of whole wheat…just be sure to boil it in salted water for adequate seasoning. I love hard boiled eggs and pickles in my tuna salad for flavor and texture. I find two eggs to be the perfect amount, but you can always add more or less. Furthermore, I chop up both dill pickles and sweet pickles for a tasty surprise. 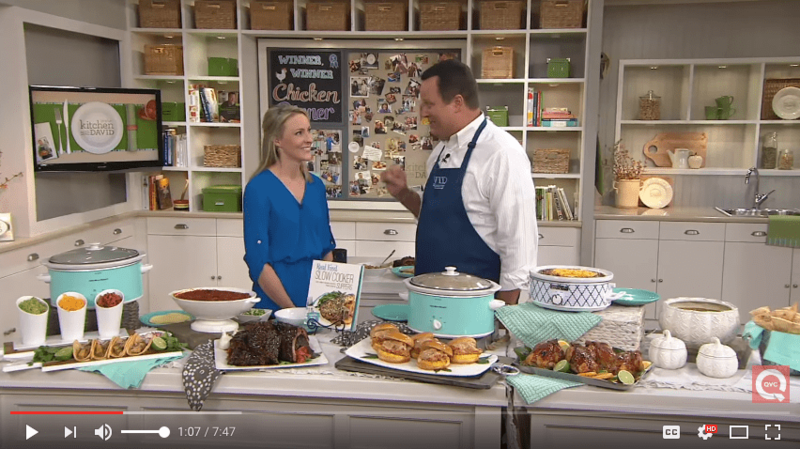 I’m telling you, sweet plus savory makes any macaroni salad even better! 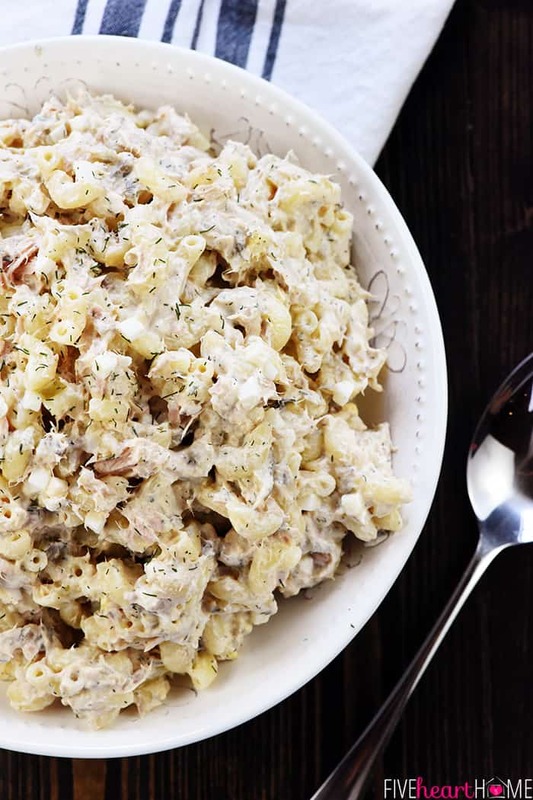 My mom always made Tuna Pasta Salad with mayonnaise, but I like to swap out half of the mayo for Greek yogurt. The flavor is still there, but the Greek yogurt reduces calories and adds protein while still keeping everything creamy dreamy. Finally, the seasoning! Add enough salt and be generous with the freshly ground pepper. But you know what takes this salad from good to great? DILL. If you can get your hands on some fresh dill, please, please, please use it! So. Good. But if your herb garden is currently blanketed by a layer of snow (or if your grocery store is flat out), not to worry…dried dill will do the trick just fine. In a big bowl, mix up your tuna/eggs/pickles/mayo/Greek yogurt/dill/seasonings at least an hour ahead of time, but as far out as the night before. Cover and pop in the fridge. Then, when you’re getting close to lunch or dinner time, cook your macaroni (or shells or whatever) until al dente and run under cold water until no longer warm. Drain well and stir the pasta into the chilled tuna mixture. Finally, cover and chill the whole salad for about 30 minutes before serving. Again, you don’t have to follow those steps. 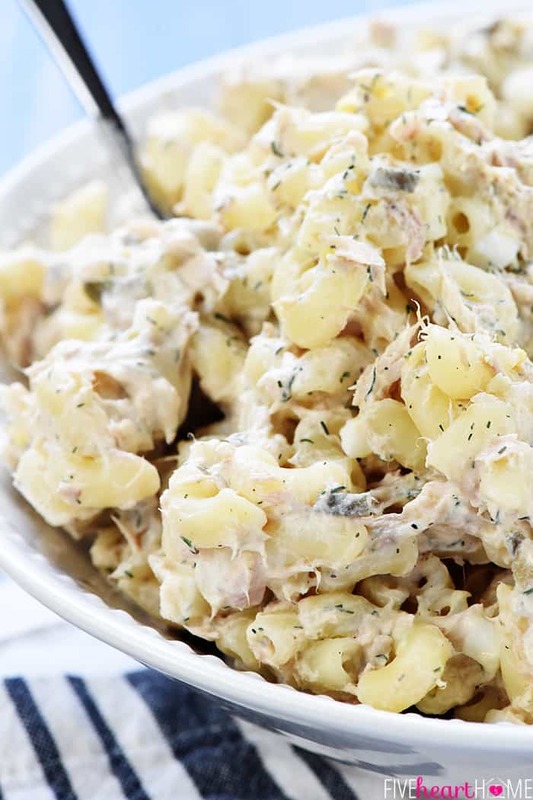 You can throw together your entire Tuna Pasta Salad at the last minute and eat it right away. 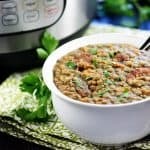 Or you can make it a good bit ahead of time and enjoy it after it comes out of the fridge. Just remember that stirring in a little extra dressing (mayonnaise, Greek yogurt, or both) after a long stint in the fridge can always bring this salad back to life, whether recently prepared or as leftovers. 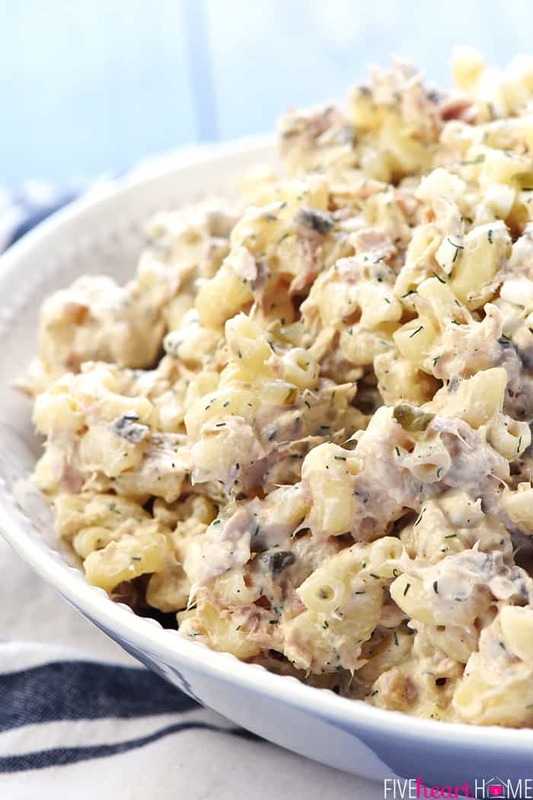 This Tuna Pasta Salad is nothing fancy, y’all, but it’s a classic and a family favorite. Despite its homely appearance (I’m telling you, it’s a bit challenging to take attractive pics of creamy pasta salad), it’s a great recipe for busy weeknights or weekend lunches or when the fridge and pantry are looking bare. I hope you enjoy it as much as we do! It’s important to measure your pasta by weight, because measuring it in a measuring cup can result in different amounts of pasta depending on the size/shape of the pasta. This recipe calls for 8 ounces of pasta, which is typically half a package (since most pasta is sold in a 1-pound bag or box). As long as you eyeball it pretty precisely, you don’t actually have to weigh it. Just don’t measure it out in an 8-ounce glass measuring cup, which is intended to measure liquid ingredients, not dry ingredients. I typically chop my own pickles for bigger chunks, but you may certainly use pickle relish in this recipe to save time. I like 365 brand Organic Dill and Sweet Relishes from Whole Foods because they don’t have the food coloring (and other preservatives) found in most store-bought pickle relishes. Feel free to stir in a few stalks of chopped celery or half of a diced onion, if you like. 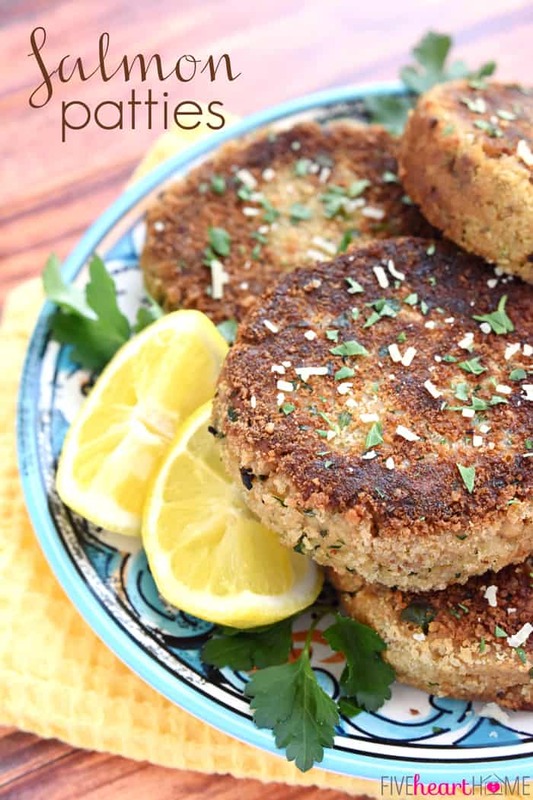 If you’re feeling fancy, you could even toss in some capers! In a large bowl, mix together the flaked tuna, chopped eggs, chopped sweet and dill pickles, Greek yogurt, mayonnaise, dill, salt, and pepper. Cover and chill in the refrigerator for at least an hour. Boil the pasta according to package directions in well-salted water. Pour into a colander and hold under cold running water until the pasta is cool. Drain the pasta and stir it into the chilled tuna mixture until well combined. Cover and chill for 30 minutes to an hour more before serving. Giving the tuna mixture time to chill allows the flavors to blend. On the other hand, chilling the finished salad for too long can cause it to dry out (since the pasta absorbs the dressing the longer it sits). 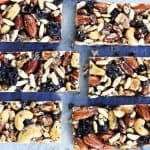 This is why the directions are written as they are; however, you can prepare the Tuna Pasta Salad all at once and eat it right away (or let it chill and eat it later) if you wish. See all of our PASTA SALADS <<< here! 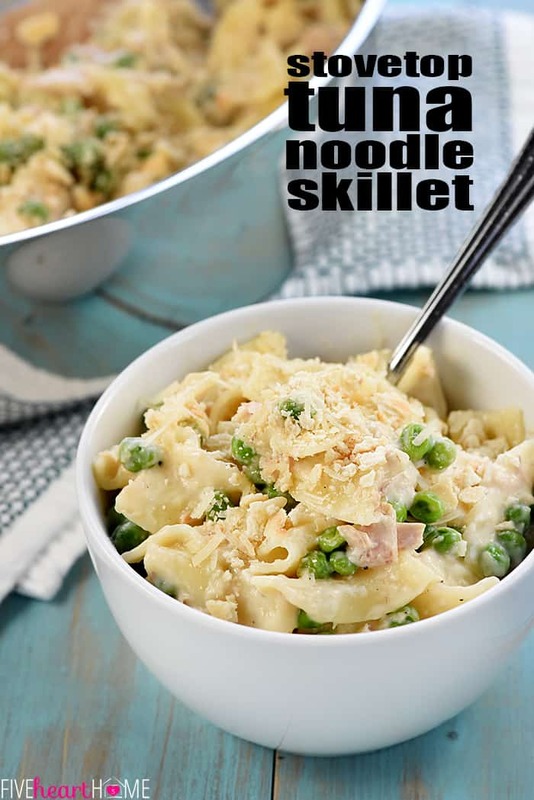 Have you ever made this using leftover macaroni and cheese? 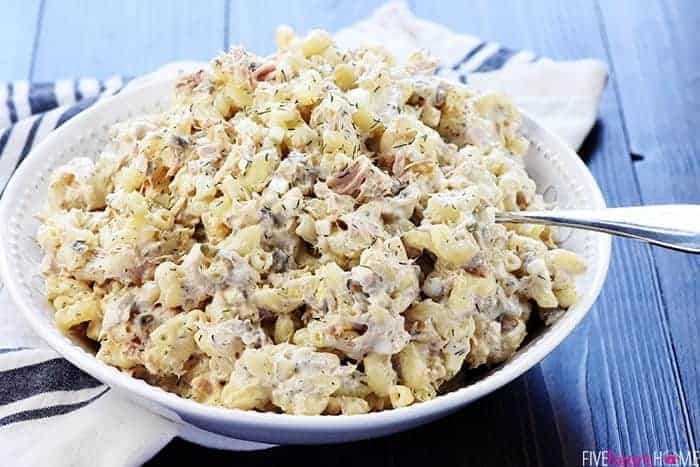 It’s really good I just stir in my tuna salad to the leftover ( whenever I have some) mac &cheese. 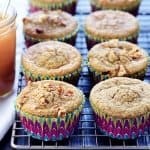 Love seeing the old school recipes thanks. Keep up the good work! This is now my favorite tuna salad. I’ve been eating the betty crocker tuna salad since I was a kid and my grandma used to make it. 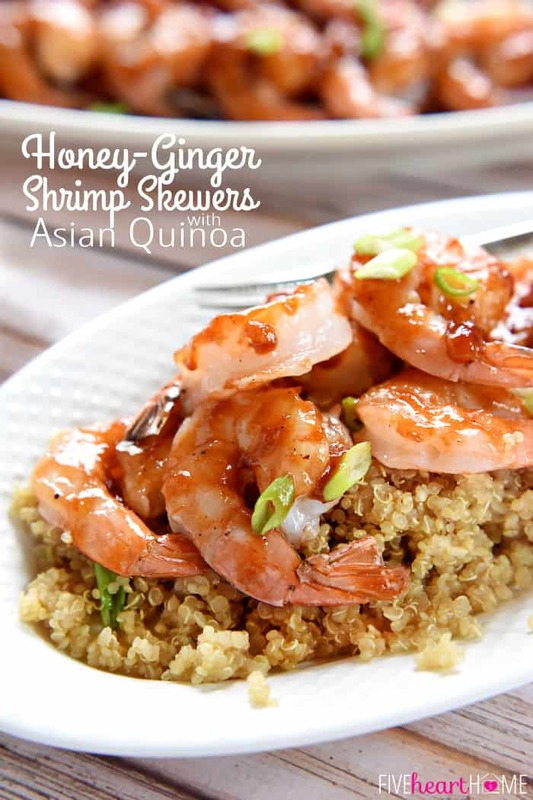 It’s a comfort food for me, this version is healthier and more delicious! Yay, Mindy! Tuna salad reminds me of childhood as well and I definitely view it as comfort food, too. 🙂 I’m so glad you enjoyed this version!